At Transform Consulting Group, we make it a priority to stay current with the latest research and trends across our clients’ sectors. For example, we wrote in a previous blog about a new practice where programs are using a two-generational approach, which looks to achieve greater impact through services that support both children and adults. 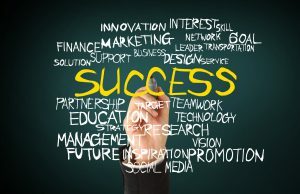 Many times, those program models are based on research that support their success. In this blog, we spotlight an innovative study that is being used in many sectors: the Adverse Childhood Experiences (ACEs) Study. Between 1995 and 1997, Dr. Vince Felitti from Kaiser-Permanente and Dr. Bob Anda with the Center for Disease Control (CDC) conducted surveys of more than 17,000 adults in Southern California about trauma experienced in their childhood. The trauma included abuse, neglect, parental mental illness, incarceration, poverty, substance abuse, divorce or separation, and domestic violence. 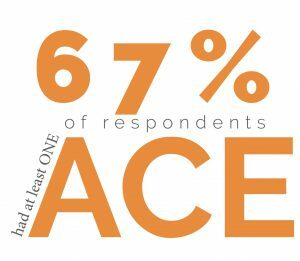 The researchers found that one in eight respondents had four or more ACEs (1 point for every “yes”), and two-thirds (67%) of respondents had at least one ACE. What are the implications of an ACE score? The researchers found a strong relationship between ACE scores and negative health outcomes, in that a higher ACE score resulted in higher rates of illness and disease. 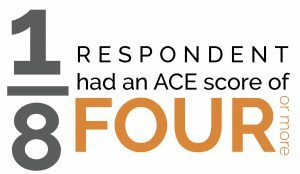 Specifically, they reported for those who had an ACE score of four or more, they were 2.5 times more likely to have hepatitis, 4.5 times more likely to have depression, and 12 times more likely to attempt suicide compared to those with an ACE score of zero. In addition, those who had an ACE score of seven or more had triple the lifetime risk of lung cancer and 3.5 times the risk of ischemic heart disease, the number one killer in the United States (as of 2014). Some reacted to these results without shock, already linking childhood trauma with higher rates of at-risk behaviors, such as smoking and drinking. However, research now shows the effect childhood trauma has on the developing brain, including inhibiting the prefrontal cortex, which is responsible for reasoning and impulse-control, as well as the amygdala, which is the brain’s fear-response center. This research is important to know; however, the ACEs Study also shows that those who do not partake in high-risk behaviors are still more likely to develop heart disease or cancer. As Nadine Burke Harris explains in her TED Talk on this subject, this is due to the hypothalamic-pituitary-adrenal axis, the brain and body’s fight-or-flight response system. She equates this to seeing a bear in the forest and how your body recognizes the threat, activates the axis, and increases the body’s stress response (higher heart rate, opened airway, eyes dilate, etc. ), so you are ready to either fight or run from the bear. This is a life-saving stress response when you are in a forest with a bear, but what happens when this stress response is triggered repeatedly due to threats in the home, or at school, or anywhere else in life? Having this stress response triggered in a child repeatedly has been shown to negatively impact their developing brain, immune system, hormonal systems, and how their DNA is read, to the point of higher rates of illness and disease in later life, as the ACEs Study confirms. By popular demand, Dr. Anda released to the public a PDF of the questionnaire used to identify one’s ACE score. It is a simple 10-question survey that anyone can administer in which a “yes” equates to one point. The sum of all “yes” responses is an individual’s ACE score. Some government agencies, such as health departments are adding the ACEs questionnaire to other survey instruments administered to the public to gather information about their local population’s trauma experiences. No matter your sector or nature of work, there are a few relevant takeaways from this study. Adverse childhood experiences are very common and affect the majority of the population regardless of income, race, or other socio-economic factors. ACEs negatively impact a child’s development in many ways. The more ACEs experienced, the greater risk for illness and disease. At Transform Consulting Group, we provide project management for the Early Learning Advisory Committee (ELAC), which consists of seven volunteer workgroups that focus on different aspects of early learning. Multiple ELAC workgroups have used the findings from this ACEs Study to inform their work, including the Child Development and Well-Being workgroup. In 2017, this workgroup helped draft a policy on suspension and expulsion using brain development research that relates to one finding from the ACEs Study which shows how higher ACE scores negatively impact a child’s brain and social-emotional development. In addition to careful wording in the policy, the workgroup is also developing resources to support the implementation of this policy, as well as information on brain development and trauma’s impact. Another ELAC workgroup, Evaluation of Child and Family Outcomes, is looking to use data from the ACEs Study as family outcome measures, including reporting the barriers created by childhood trauma and how families are doing. The Indiana State Department of Health is planning to add the ACEs questionnaire to an upcoming survey, so there will be information on ACEs scores for some Hoosiers. We at Transform Consulting Group know the importance of understanding the latest research to help our clients align with best practices and accelerate their impact. Want to learn more about how we can support your work and integrate the latest research? Contact us today! It can be rewarding providing a program or service that is meeting an important need in the community! 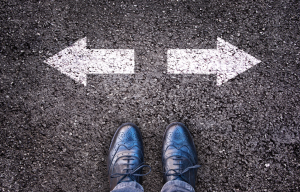 Part of providing your program or service is meeting the contractual and grant obligations laid out, but how do you go beyond that and ensure you keep things fresh? This is essential as you manage the program overtime. It is vital to understand the purpose and mission of the program being implemented, especially as you look to make updates. The Indiana Heart Gallery (aka Heart Gallery) is a program created by the Indiana Department of Child Services in 2007 as one way to help children in foster care across Indiana find a family to call their own. Many of the children featured in the Heart Gallery are older or special needs children, minorities, or members of a sibling group. The Heart Gallery is unique because of the professional portraits of these youth that create the display, which connects a face to a sometimes invisible need. The primary purpose of the Heart Gallery is to raise awareness about foster-adoption in Indiana and to help find families for the children featured. As we consider changes and opportunities for the program, we continue to go back to how this would support the purpose of the Heart Gallery. We partner with organizations across the state to host the Heart Gallery. After some review and discussion, we found that the same types of venues tended to be the ones hosting the Heart Gallery: churches, YMCAs, and libraries . While those venues had the target audience of the Heart Gallery (venues where families frequent and can take a moment to visit the display), we wanted to expand beyond those venues to reach other potential adoptive families across the state. Not only did we review the types of venues the Heart Gallery was on display, but we took a deeper look at where those venues were located. For example, we found we were visiting all of the DCS regions of the state, but had not been on display at every county across the state. Find out what your staff and external partners would like to see different about the project. With the Heart Gallery, we send a survey to the main contact who hosts the Heart Gallery. This helps us understand how we can better support our host partners and solicit new ideas. As well, we have a tracking sheet dedicated to venue feedback for staff to share thoughts and ideas on each venue. Through this we learned that front-line staff at some venues wanted more information on the Heart Gallery in order to better answer common questions. This resulted in the development of a Host Packet, which is shared electronically with the contact for the venue to pass along to staff, and in hard copy when the display is setup to leave on-site. The Project Manager also had conversations with staff about what is working and what could be improved. Through those conversations it was discovered that the collateral materials (banner, brochure, swag) would benefit from a revamp in design and use, including the development of new outreach tools. Use feedback gathered and meet with staff to outline the priorities of suggested changes. Take into consideration the updates that will have the biggest impact on the purpose of the project, as well as efficiencies for staff. Through conversations with Heart Gallery staff, it was determined that updating the collateral materials and processes for targeting locations would have the most immediate impact on the purpose of the project and staff efficiencies. Mainly, rebranding the materials in place, developing a few new tools, and implementing outreach tours for targeted outreach. The Project Manager developed an Outreach Tour Proposal, based on the upcoming Heart Gallery schedule to find new host partners in specific geographic areas. The team discussed how to make it a successful event to reach the program’s goals. After the first outreach tour, the team reconvened to assess how it went, what changes to make to the next one and systems/processes to put into make to standardize it for other team members. Through planning and reassessing, the outreach tours are now an effective outreach strategy for the Heart Gallery. We are scheduling a planning retreat for the Heart Gallery this fall to discuss 2018 goals. Making time to reflect on your programs, services, their impact and how they are delivered can get your staff reenergized and get you closer to accomplishing your goals. Does it feel like your programs or staff are stuck in a rut? It might be time to reassess your programs, how they are delivered and the impact you want to accomplish. At Transform Consulting Group, we want to help give your programs a boost. Contact us today for a free consultation! If you would like to learn more about the Heart Gallery, you can go to http://www.in.gov/dcs/3033.htm or www.adoptachild.in.gov. In this new blog series on community coalitions, we start by highlighting the recent Indiana Coalition Summit. Be on the lookout for future blog posts related to community coalitions! In 2016, Transform Consulting Group managed the planning for the first annual Indiana Summit for Economic Development via Early Learning Coalitions (aka the Indiana Coalition Summit), hosted at the Horizon Convention Center in Muncie, in partnership with Muncie BY5, Early Learning Indiana, and Indiana Early Learning Advisory Committee (ELAC). 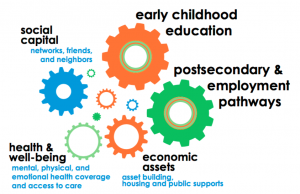 This was the first statewide event dedicated to bringing together early learning, business, education, civic, and other community leaders to understand the business case for investment in early childhood. As well, the Indiana Coalition Summit delivered ways to develop and sustain an early learning coalition in one’s community, whether rural, suburban or urban. That gathering attracted over 500 attendees across all sectors and affirmed the need for early learning coalitions in the state. 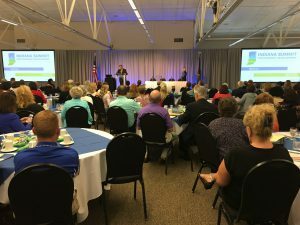 Continuing with that momentum, Transform Consulting Group led the planning and execution of the second annual Indiana Summit for Economic Development via Early Learning Coalitions, this time held on June 5, 2017 at the Monroe County Convention Center in Bloomington. The Summit attracted close to 400 attendees, many of them connecting to the Summit for the first time. This year, Transform Consulting Group and the planning team, consisting of representatives from Monroe Smart Start, Muncie BY5, ELAC, and Early Learning Indiana, honed in on connecting the “soft skills” (or executive functioning skills) that employers desire in today’s workforce with investing in early learning. The morning of the Indiana Coalition Summit focused on building awareness around the need for early learning support, especially for the non-early-learning professionals in attendance. Erin Ramsey with Mind in the Making, The Bezos Family Foundation kicked off the day with a presentation outlining how investing in early learning shapes the workforce, linking executive functioning skills in children to skills desired by employees (i.e. reflecting, analyzing, and evaluating). This was followed by a short presentation about the current landscape for economic development and early learning from the State’s perspective by Kevin Bain, CEO and Executive Director of the Welborn Baptist Foundation in Evansville and the Chairman of ELAC. In his presentation, Bain highlighted information shared in the most recent ELAC Annual Report including the online county profiles (now available through the ELAC website) about “where” Indiana currently is related to key early learning measures, and “what” Indiana should do to improve. The lunch presentations kicked off with Jeffery Connor-Naylor from ReadyNation debuting a recent Indiana brief outlining how developing social-emotional skills in early childhood positively impacts future workforce success. 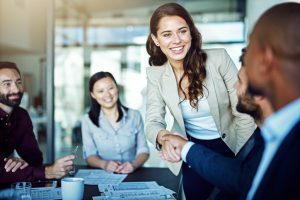 Particularly, the necessity of employees being capable of developing and sustaining relationships. The keynote presentation was given by Dr. Tim Bartik from the W.E. Upjohn Institute in which he made the economic case for investing in early learning. He shared data such as per dollar invested, early childhood programs increase the present value of state per capita earnings by $5.00 – $9.00. Dr. Bartik also shared that the costs for investing in early learning are modest, giving the example of universal full-day pre-K for 4-year-olds costs about 4% of what we pay for K-12. The afternoon breakout sessions focused on supporting attendees who are developing community early learning coalitions. These sessions were framed around the forthcoming Community Coalition Building Toolkit being developed by the ELAC Provider Participation and Advancement workgroup. Transform Consulting Group’s President, Amanda Lopez, led the session “Creating a Collective Vision/Plan”, utilizing her experience developing strategic plans and working with community coalitions. In her presentation, Lopez reviewed the four steps of strategic planning (detailed in this previous blog): 1) Collaborate; 2) Assess; 3) Facilitate Consensus; and 4) Create the Plan. 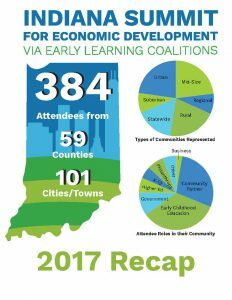 The Indiana Summit for Economic Development via Early Learning Coalitions is a shining example of an event that brings together stakeholders from different sectors for a common goal: to have thriving communities by investing in early learning. It laid the groundwork for how to have different, and even unusual, partners work together while also giving attendees the chance to network and receive training on developing their community coalition. 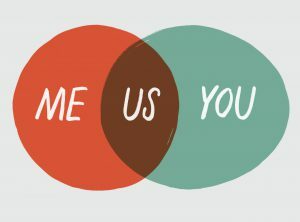 If your organization is interested in connecting with or starting a community coalition with a focus on early learning, check out the resources available from the Indiana Coalition Summit on the Indiana Summit Resource Page or contact us at Transform Consulting Group to get connected! When a business plans to open a new store or restaurant, the business first conducts market research to ensure a good fit and a successful venture. In the public sector, we call this a “needs assessment”. 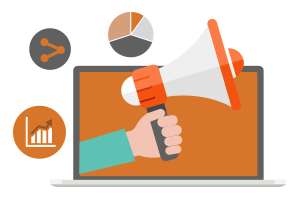 Whether your organization is a non-profit, hospital, school or government agency, more than likely you have been asked for or initiated a needs assessment. Why? The needs assessment is a great opportunity to step back and build understanding about the target population (aka, intended clients), their strengths, needs, concerns and goals, as well as taking a look internally at your own organization to ensure a good fit. In Indianapolis, we have a Center for Working Families (CWF) program model that was developed by the Annie E. Casey Foundation to help low-income families achieve long-term financial stability. A group of local funders and partners help support and coordinate the CWF model to ensure a good fit with communities and strong fidelity at implementation. Transform Consulting Group has helped a few organizations complete a needs assessment and project implementation plan to implement CWF in Indianapolis. Most recently, we worked with Shepherd Community Center, a multi-service center on the Near Eastside of Indianapolis. Achieving CWF status would designate Shepherd Community Center as a location where low-income families could access a coordinated or bundled set of three key services to help lift them out of poverty and achieve long-term financial stability. In order to demonstrate the need for CWF in the neighborhood that Shepherd Community Center supports, Transform Consulting Group conducted a community needs assessment within the Near Eastside neighborhood of Indianapolis and completed an internal assessment of the organization. Completing the needs assessment allowed Transform Consulting Group staff an opportunity to connect with the target audience through in-person focus groups and surveys at key community gatherings as well as meetings with key community partners. We also gathered key indicators from the Census and other external data sources. The information collected included demographics, income levels, education levels and goals, goals, and perceived gaps in community services. Combined with the stakeholder feedback, we developed a comprehensive profile of the targeted community. Data was analyzed and key findings shared with Shepherd Community Center leadership. Results from the needs assessment not only demonstrated a strong need in the community, but will also serve as a baseline of information for future CWF planning and programming within this community. 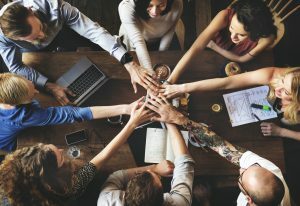 Understanding the needs of your community or “market” is the foundation for successful organizational programming that will have the greatest, long-lasting impact. Transform Consulting Group looks forward to new opportunities helping organizations like Shepherd Community Center get their finger on the pulse of their community needs and effectively provide support. Contact Transform Consulting Group today to learn more about how we can assist your organization.